Background: This report describes treatment outcome following delayed miniplate osteosynthesis (MPO) of maxillofacial fractures. Materials and Methods: The records of patients who underwent delayed MPO of facial fractures from January 2011 to December 2014 at the Oral and Maxillofacial surgery Unit of the Federal Medical Centre, Owo, Nigeria were retrospectively reviewed. Data retrieved were age, gender, etiology of trauma, site of fractures, and time lapse from injury to treatment. Follow-up at postoperative intervals consisted of clinical and radiographic examinations. Outcome variables such as wound infection, wound dehiscence, malocclusion, hardware failure, fracture stability, and neurosensory disturbance were recorded. Results: Thirty-one patients with 52 facial fractures were treated. There were 18 (58.1%) mandibular, 8 (25.8%) maxillary fracture while 5 (16.1%) fractures occurred in both jaws. All patients had a stable fixation and normal healing. Thirteen complications occurred in 11 patients representing 35.5% of the total. Malocclusion and wound infection were the most common complication. More complications occurred in late treatment group. Conclusion: MPO with or without postoperative intermaxillary fixation is effective in the delayed facial fracture. Treatment delay may increase the incidence of complications. Miniplate osteosynthesis (MPO) without interfragmentary compression is a method of direct fixation of fractures through an open approach which allows anatomical reduction of the fragments and immediate return to function. It provides functionally stable fixation, better patient comfort, and avoids damage to adjacent vital structures, however, its rigidity has been questioned particularly in delayed and displaced fractures. Studies examining treatment outcome after MPO have focused mainly on mandibular fractures and have been mostly from developed countries.,, There is paucity of data on the subject from Sub-Sahara Africa. The purpose of this study was to evaluate treatment outcome, stability, and complications of delayed MPO for the treatment of facial fractures in our center. The main objective in direct fixation is to provide functional stability of the fracture construct thus allowing predictable healing with minimal complications. The records of patients who underwent delayed MPO of maxillofacial fractures from January 2011 to December 2014 at the Oral and Maxillofacial Surgery Unit of the Federal Medical Centre, Owo, Nigeria were retrospectively reviewed. The inclusion criteria were patients whose maxillofacial fractures occurred during the study period and were internally fixed through an intraoral or an extraoral approach using 2.0 mm titanium miniplates and monocortical screws (Aesculap AG & Co. Kg Tuttlingen, Germany) and who had a minimum period of follow-up of 1 week were included in the study. Exclusion criteria included patients with incomplete records and those with underlying medical disease. Data retrieved include age and gender distribution, etiology of trauma, site of fractures, and time lapse from injury to treatment. They were grouped according to the time lapsed from injury to treatment as “delayed” (>24 h - <7 days) and “late” (≥7 days) groups. Patients were operated by the same surgeon under general anesthesia with two-point fixation comprising two miniplates in mandible or one miniplate in maxilla per unit fracture. Adequacy of fracture fixation was checked immediately after fixation by clinical manipulations in three-dimensions. If fractures were found to be insufficiently rigid, postoperative intermaxillary fixation (IMF) was carried out and usually maintained for 1–2 weeks. Follow-up at each postoperative visit consisted of clinical and radiographic examinations. Outcome variables including infection, wound dehiscence, malocclusion, nonunion, fracture stability, neurosensory disturbance, damage to vital structures and hardware failure were recorded. Hardware failure was classified as plate exposure, plate fracture, loosening of screws, and plate palpability. All the complications, when occurred, were managed in a standard fashion. Pain and wound infection was treated by analgesic and antibiotics respectively while malocclusion and neurosensory disturbances were monitored until resolution. Data obtained were entered into SPSS Statistical Software Version 21 (Armonk, NY: IBM Corp. USA), explored and analyzed. Data pertaining to predictor and outcome variables were represented as number (%) and mean ± standard deviation (SD). Level of statistical significance was set at 5% (P < 0.05). A total of 52 maxillofacial fractures in 31 patients comprising 30 males and 1 female (M:F ratio of 30:1) were treated with MPO with or without IMF. The age range was 16–65 years (mean 31.1 SD 11.6). The highest frequency of fracture (51.6%) occurred in 21–30-year age group. 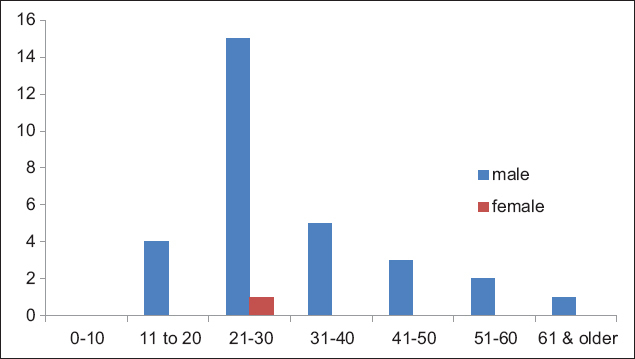 The age distribution is shown in [Figure 1]. 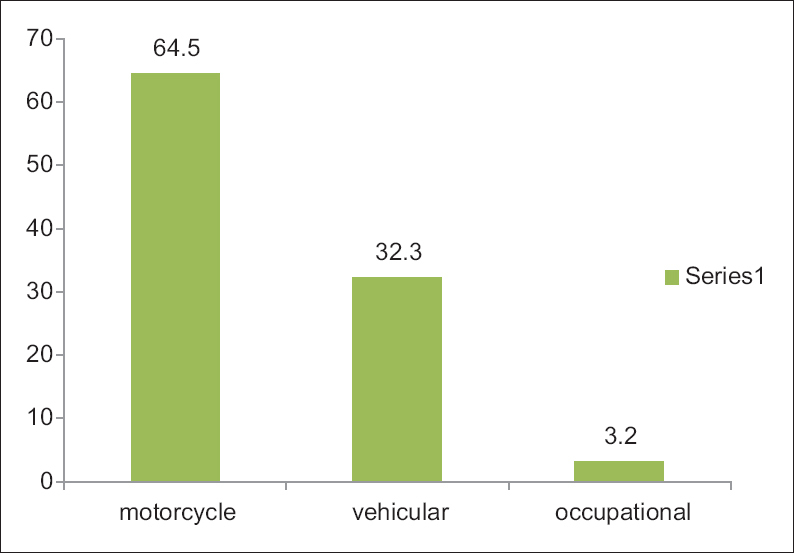 In this study, motorcycle and vehicular crashes were the most frequent cause of the fractures accounting for 20 (64.5%) and 10 (32.3%) respectively. Occupational injury was responsible for only 1 (3.2%) of the total [Figure 2]. 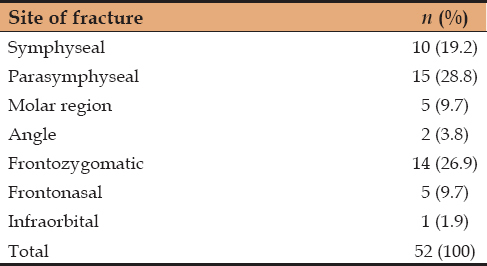 As shown in [Table 1], fractures occurred most commonly in the mandible 32 (61.5%) than the maxilla 20 (38.5%). The site distribution in the mandible is parasymphyseal 15 (28.8%), symphyseal 10 (19.2%), molar region 5 (9.7%), and angle 2 (3.8%) while that in the maxilla is frontozygomatic 14 (26.9%), frontonasal 5 (9.7%), and zygomatico-maxilla 1 (1.9%). Time from injury to treatment time range 4–56 days (mean = 13.3, SD = 10.3) whereas the majority 24 (77.4%) were classified as late treatment group [Figure 3]. 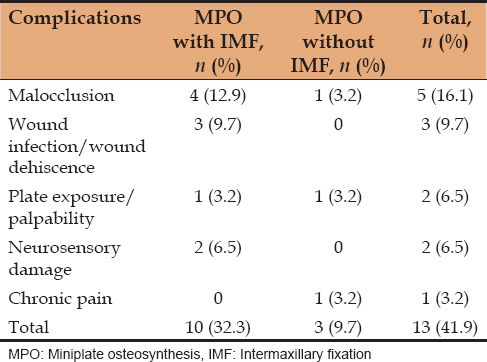 In seventeen (54.8%) of the patients, postoperative IMF was used to protect the fixation while MPO without IMF was used in the remaining 14 (45.2%). More complications occurred in the IMF group as shown in [Table 2]. The mean duration of follow-up was 43.2 ± 35.8 days (range 7–140) while the mean number of outpatient visits was 3.6 ± 2.0 (range 1–7). Healing and fixation were satisfactory in all patients. There were 13 complications in eleven patients giving an overall complication rate of 35.5%. Two patients had >1 complication. The most common complications were malocclusion 5 (16.1%), wound infection/dehiscence 3 (9.7%), plate exposure/palpability 2 (6.5%), neurosensory damage 2 (6.5%), and chronic pain 1 (3.2%). 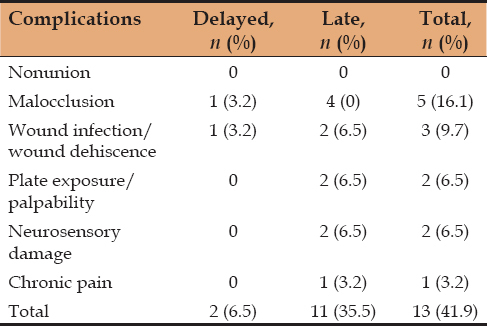 More complications were recorded in the late treatment group [Table 3] and in the mandible [Table 4]. There was no significant difference in the number of complications between the two groups. Treatment was delayed in the majority of our cases mostly because of system delay and relatively high cost of treatment. The additional cost of general anesthesia coupled with the cost of the bone plate is responsible for the high cost of treatment. Other studies identified coexisting life-threatening conditions as the main cause of delay. Satisfactory healing of fractures occurred in the majority of cases however high utilization of postoperative IMF to protect fixation suggests that MPO may not provide absolute rigidity in function. This trend has also been reported in earlier studies., Functionally, stable fixation in facial bone is a spectrum that varies depending on anatomic factors and fracture morphology., Furthermore, fixation requirements for multiple fractures differ from solitary fractures. Much more rigid fixation devices are usually required for multiple fractures. Other areas where reinforced fixation is required include the mandibular angle region where powerful distractive forces and presence of impacted/partially erupted teeth can lead to instability after fixation under functional load. Miniplates provide functional stability when used as a load sharing fixation rather than a load-bearing one. It should be noted that in unfavorable fracture morphology such as comminuted, multiple and defect fractures, postoperative IMF should be considered to protect MPO. Complications after MPO include those related to the surgical procedure and those related to primary stability of fixation device. Wound Infection/wound dehiscence and neurosensory damage are related to the surgery and largely depend on surgeons' experience, whereas nonunion, malunion and hardware failure relate to the primary stability. Analysis of outcome of MPO must take into cognizance these various factors to make a comparison of result feasible. In the present study, all surgeries were carried out by the same surgeon. This has made it possible to control for surgeons' experience as a confounding factor. Opinion differs with respect to effect of timing of direct fixation on the incidence of postoperative complications. Gazal, Singh et al., and Maloney et al. reported increased incidence of complication after delayed treatment whereas other authors, found low complication rate in delayed intervention. More complications were seen in late treatment group compared to delayed group fracture in this series. Hermund et al., systematic review of literature found no strong evidence that treatment delay increase complication but noted that significantly fewer cases of early intervention made comparison difficult. New studies including a substantial number of cases treated on an acute basis are needed. Overall complication rate is within the reported range,,, malocclusion being the most common complication. Malocclusion is attributable to relative instability of fixation device under functional demand. Postoperative IMF for limited time period is usually effective to correct this. Two cases of parasthesia in the distribution of mental nerve reported in this study occurred with parasymphyseal fractures. Direct involvement of mental foramen in the fracture coupled with difficult instrumentation during placement of fixation may be responsible for the nerve deficit. However, all cases resolved spontaneously without further treatment indicating that the injury is reversible. No case of plate fracture or damage to roots was noticed in our series suggesting that even in displaced and delayed fracture, MPO plus or minus postoperative IMF is effective fixation avoiding damage to vital structures. The relative strength of the titanium plate and monocortical screws provide a useful application. Our data include miniplate utilization for treating maxillary fracture and offers information about complications when used in midface. Fewer complications were seen in the midface in this series. The midface is not mobile and is not subjected to as much deforming forces from powerful muscles as the mandible. It is conceivable that the incidence of stability related complications is lower; however, this may be because the majority of fractures occurred in the mandible. Motorcycle accident was the most common cause of fracture while the mandible was the most affected. The majority of patient presented late for treatment, however, outcome of treatment was satisfactory. Miniplate osteosythesis with or without postoperative IMF is effective in delayed facial fracture. Treatment delay may increase incidence of complications. Adeyemo WL, Iwegbu IO, Bello SA, Okoturo E, Olaitan AA, Ladeinde AL, et al. Management of mandibular fractures in a developing country: A review of 314 cases from two urban centers in Nigeria. World J Surg 2008;32:2631-5. Okoturo EM, Arotiba GT, Akinwande JA, Ogunlewe MO, Gbotolorun OM, Obiechina AE. Miniplate osteosynthesis of mandibular fractures at the Lagos University Teaching Hospital. Nig Q J Hosp Med 2008;18:45-9. Ogundipe OK, Afolabi AO, Adebayo O. Maxillofacial fractures in Owo, South Western Nigeria. A 4 year retrospective review of pattern and treatment outcome. Dentistry 2012;2:132-5. Singh RK, Pal US, Agrawal A, Singh G. Single miniplate osteosynthesis in angle fracture. Natl J Maxillofac Surg 2011;2:47-50. Gazal G. Evaluation of the effectiveness of early or delayed treatment upon healing of mandibular fractures: A retrospective study. Eur J Dent 2015;9:87-91. Champy M, Loddé JP, Schmitt R, Jaeger JH, Muster D. Mandibular osteosynthesis by miniature screwed plates via a buccal approach. J Maxillofac Surg 1978;6:14-21. Ellis E. Rigid versus non-rigid fixation. In: Miloro M, Ghali G, Larsen P, Waite P, editors. Peterson's Principles of Oral and Maxillofacial Surgery Ontario. Ch. 20. Canada: BC Decker; 2004. Peled M, Ardekian L, Abu-el-Naaj I, Rahmiel A, Laufer D. Complications of miniplate osteosynthesis in the treatment of mandibular fractures. J Craniomaxillofac Trauma 1997;3:14-7. Nakamura S, Takenoshita Y, Oka M. Complications of miniplate osteosynthesis for mandibular fractures. J Oral Maxillofac Surg 1994;52:233-8. Smith WP. Delayed miniplate osteosynthesis for mandibular fractures. Br J Oral Maxillofac Surg 1991;29:73-6. Rudderman RH, Mullen RL, Phillips JH. The biophysics of mandibular fractures: An evolution toward understanding. Plast Reconstr Surg 2008;121:596-607. Kearns GJ, Perrott DH, Kaban LB. Rigid fixation of mandibular fractures: Does operator experience reduce complications? J Oral Maxillofac Surg 1994;52:226-31. Maloney PL, Lincoln RE, Coyne CP. A protocol for the management of compound mandibular fractures based on the time from injury to treatment. J Oral Maxillofac Surg 2001;59:879-84.